Synopsis (Goodreads): With a career, a boyfriend, and a loving family, Piper Kerman barely resembles the reckless young woman who delivered a suitcase of drug money ten years ago. But that past has caught up with her. Convicted and sentenced to fifteen months at the infamous federal correctional facility in Danbury, Connecticut, the well-heeled Smith College alumna is now inmate #11187-424-one of the millions of women who disappear “down the rabbit hole” of the American penal system. From her first strip search to her final release, Kerman learns to navigate this strange world with its strictly enforced codes of behavior and arbitrary rules, where the uneasy relationship between prisoner and jailer is constantly and unpredictably recalibrated. She meets women from all walks of life, who surprise her with small tokens of generosity, hard words of wisdom, and simple acts of acceptance. Heartbreaking, hilarious, and at times enraging, Orange Is the New Black offers a rare look into the lives of women in prison, why it is we lock so many away, and what happens to them when they’re there. My thoughts: After hearing rave reviews of Netflix’s adaptation of Orange is the New Black, it immediately went on my to-watch list. Unfortunately, I just don’t have much time for watching TV these days (I’m still trying to finish Veronica Mars!). What I do have is 3 hours a day to listen to audiobooks on my unfortunate commute. Fiction is really hit or miss with me in audio format, but I’ve had a lot of luck with narrative nonfiction, so this was a great audiobook choice for my early morning drive. 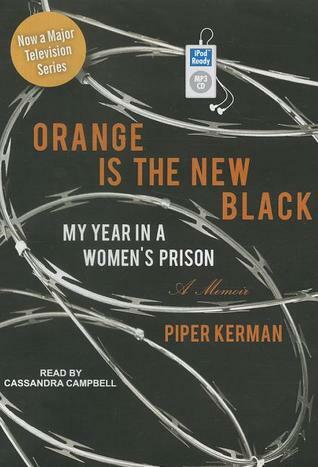 Piper Kerman was a recent Smith grad who fell in with an impossibly cool lesbian who happened to work with a West African drug lord. Years after ending the relationship, she was indicted on federal charges despite her very limited involvement in the crimes. Her sentencing was postponed for years while prosecutors attempt to bring charges against the Nigerian drug lord her ex-girlfriend worked for, so it isn’t until she was in her 30s that she left her professional life and fiancee to report for a 15-month sentence in a minimum security federal prison. Rather than a nostalgic reflection on her experiences, Kerman’s narrative style is very in-the-moment. She very matter-of-factly relays her experiences without being overly dramatic or minimizing her culpability, and the clear prose made this very easy to listen to. While her writing might not be quite the caliber of Elizabeth Gilbert’s, her privilege didn’t grate on me the way Gilbert’s did in Eat, Pray, Love. The descriptions of the inner workings and rules within the prison, both formal and informal, were fascinating. Accounts of the way Mother’s Day is celebrated or the kind ways seasoned prisoners aid newcomers were moving and poignant. My only complaint is that the relationships Kerman forms with her fellow inmates were not more developed. I wasn’t so much interested in her running and yoga routine or her electrical job as the interactions with the other women in the prison. While I might have lost interest in reading this in favor of an action and drama packed young adult novel had I had the print version, this was one of the best audiobooks I’ve listened to in the last couple months. Cassandra Campbell’s voice and delivery were exceptional, and I’ll definitely be seeking out more titles performed by her. If you like narrative nonfiction and women’s memoirs, you’ll probably enjoy this book. I also think it would make an excellent book club selection, as it contains lots of fodder for discussion. Kerman’s critique of the criminal justice system and the nature of race and class distinctions within the prison could keep a group talking for a long time. That said, I’ve been interested in this one as well. I haven’t watched the TV show (I haven’t even gotten through Veronica Mars myself — I just need to finish the third season to finally accomplish that). But I am interested in memoirs. I’ll have to look into this one. Great review, Molly! Great review! I’ve also been hearing rave reviews about the adaptation, but I don’t have time to watch anything. Sadly, I don’t even time to read much these days (unless it’s a children’s book–there will always be time for that!). I know how you feel! I’ve been listening to lots of books for younger readers on audio, too, so some of them might be good for you to read with the twins.